I Knew the Day Would Finally Come! We were There - Americans Were on The Moon, for all Mankind. 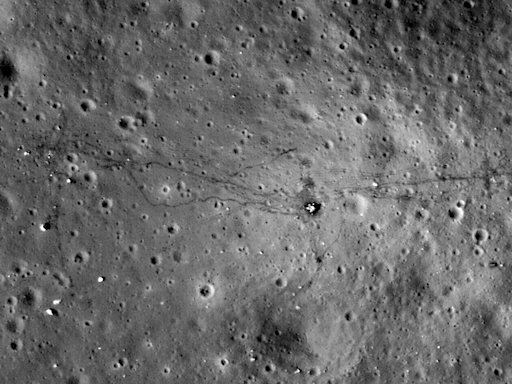 A spacecraft circling the moon has snapped the sharpest photos ever of the tracks and trash left behind by Apollo astronauts in their visits from 1969 to 1972. Images taken by NASA's Lunar Reconnaissance Orbiter from 13 to 15 miles up show the astronauts' paths when they walked on the moon, as well as ruts left by a moon buggy. Experts could even identify the backpacks astronauts pitched out of their lunar landers before they returned to Earth. "What we're seeing is a trail," said Arizona State University geology professor Mark Robinson, the orbiter's chief scientist. Isn't it cool, when chief scientists get quoted saying something like, "It's totally awesome." ?